I like Krugman. He takes a common sense approach to economics and writes clearly for a broad audience. But, like others, I have to take issue with his insistence that quantitative easing (QE) and low interest rates punish the wealthy and fulfil some progressive distributional objective. In fact they achieve the opposite result. Here is the crux of his argument. 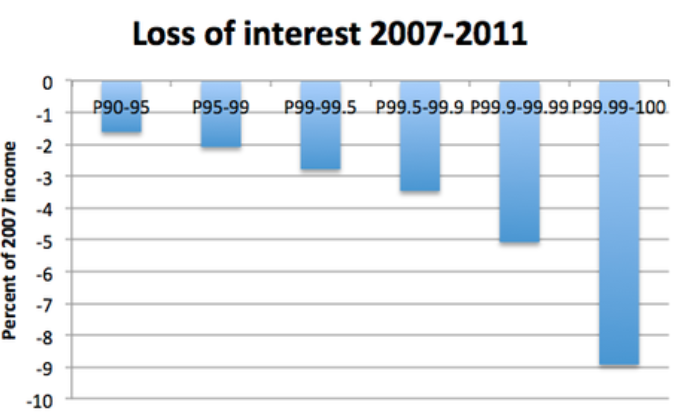 He supports his case with this graph in a previous post showing the loss of interest income for the top 10% of households. But if you are going to talk about distributional effects, you have to compare the whole distribution, not just the change over time of one cohort. Because this graph can show the exact opposite point if households in the lower income deciles have had their incomes decrease by more than this amount. In this case all it takes is for low income households to have a 5% lower real income in 2011 than 2007 and we end up with a net transfer towards the top 10%. The simple problem here is that Krugman fails to observe the change in the value of assets and instead focuses merely on the cash-flow. It is a simple fact that any asset that is a promise of future cash flows will increase in price in a low interest rate environment compared to a high interest rate environment (holding all else constant). Even the RBA shows how this effect has been a major contributor to last decade’s Australian house price boom. More over, low interest rates are even more of a transfer to those who are highly leveraged into asset markets - property, equities and so forth. Since they receive a double effect of lower borrowing costs and supported asset prices. To be clear, the table below shows a basic example of an asset representing a right to a cash-flow of 5 each year (call is $5, call it $5million, it doesn’t matter for this purpose). If the asset is purchased in the first time period, assuming for the sake of the argument that risks are perfectly captured in the yield, that there is no net positive return. You buy an asset yielding 5%, it costs you, in risk adjusted terms, 5% to buy it, so there is no economic rent to speak of here. Then in a later period the interest rate falls, and this asset is traded at a price reflecting a lower yield. That means the price has increased. Over the period when interests rates fall from 5% to 3% in this example, there has been a massive 67% gain in price of this asset, which can all be considered an economic rent. We can also consider the case where the cash-flow is declines, which probably more accurately reflects the post-crisis situation. Here the cash flows, due to a downturn in real economic activity, are falling, but so are that traded yields (the interest rate), and hence the price is supported and owners of these assets gain from capital appreciation. This is the exact scenario I see Krugman presenting. The cash-flows from owning particular assets have fallen, so interest incomes will be down for asset owners, but the prices have risen due to the interest rate adjustment. We see evidence of this all around with equities trading at record highs. To be clear, this is not some absurd reasoning I just made up (although it does overlook the expectation of capital growth in prices to make a simpler point). The Bank of England has conveniently published a document outlining their view on the distributional impacts of low rates and their QE program. By pushing down gilt yields, QE has reduced the annuity rate. But the flipside of that fall in yields has been a rise in the price of both bonds and equities held in those pension pots. Another way of explaining this is that the income flows from a pension pot (dividends in the case of equities and coupons in the case of bonds) will not be reduced by QE. Indeed, if the pension pot contains equities, then the flows could even be higher as a result of increased dividend payments from the boost to the wider economy from QE. There you have it. Low interest rates and asset purchases bail out the rich. I hope Krugman reads this and thinks more carefully, because he has a very wide influence in the public debate about these issues. What you have to remember is that the reduction in yield only happens when the asset is transferred. Prior to that it is a potential reduction in yield. AFAICS the principle is the same as house price increases. It's a distributional transfer from the young to the old, with the young being forced to save more in their pensions (because the assets are more expensive for the same yield) and therefore borrow more to buy houses, school fees, etc. There is a reduction in income to the private sector because the counter position is that the government has to spend to fund the automatic stabilisers while at the same time issuing interest earning bonds to the private sector to recover that spending. That gives more income to bond holders - a small fraction of which will be spent. If the central bank 'buys the bonds' then that is the same as not issuing the bonds at all. (The govt issues the bonds, the central bank buys them and returns the interest paid to the govt *which then uses it to issue less bonds rather than maintain the deficit*). But that reduction in income is transferred down to the current crop of pension savers - often via legislation to force pension saving which of course then forces purchases at the inflated prices locking in the lower yield. The Krugman blog posts you reference are more specific and more limited than your reading would imply. Those posts address the baffling calls for higher rates by central bank types, market participants, and various economic commenters in the face of obvious and persistent global economic weakness. Krugman's explanation is that these calls come from members of, and advocates for, an economic elite that holds a preponderance of interest-bearing assets and so are economically damaged by a low-rate regime. 1. The hostility of free-market purists who resist and resent any government intervention in the economy, especially ones of long duration, regardless of intent or result. 2. The worry by central bankers that already-low or near-zero rates leave them no weapon against future economic weakness. Obvious note: this argument makes no sense. 3. An econo-moral belief that low rates cheat virtuous savers and skillful/lucky winners of the last bubble round out of the low-risk returns they deserve on their stores of cash. If you are responding to Krugman by saying "But QE has improved the asset position of the wealthy more than it has hurt their cash flows" then I'm pretty sure he would answer that, in the current political environment, it is not at all unusual for economic advocacy to be irrational. Perhaps there is another book here: "What's the Matter with Greenwich?" "The Krugman blog posts you reference are more specific and more limited than your reading would imply." Perhaps. I probably don't have the US-specific political context at the front of mind. "If you are responding to Krugman by saying "But QE has improved the asset position of the wealthy more than it has hurt their cash flows" then I'm pretty sure he would answer that, in the current political environment, it is not at all unusual for economic advocacy to be irrational. " Not sure about that. It's a pretty good bet that people promote what is in their financial interests (assuming they understand the situation). You may be right only if these groups have ideological blinkers on, and cannot therefore see what is in their interests, hence irrational advocacy. On your comment on including the lower deciles' income income reduction (and I'm assuming you mean wages) in the analysis, are you saying the easy money policies are pushing down wages? The reason I say this is that the reason the interest income has fallen is due (possibly) to the easy money policy so to include the wages you'd have to assume its is also the result of the policy, I would think.